Yoshi’s Wooly World was a popular Wii U title released in October of 2105 that delivered something fans of Yoshi’s Island had been waiting for. The game features a unique design choice of presenting the world and characters as made of yarn and also utilizes this in interesting ways in the gameplay. More exciting news comes as Nintendo has announced that on February 3rd a 3DS port of Yoshi’s Wooly World will release, called Poochy and Yoshi’s Wooly World, and it will have new content as well. The 3DS version will continue amiibo support, and a bundle with the new Yarn Poochy amiibo will be available for $49.99 USD. 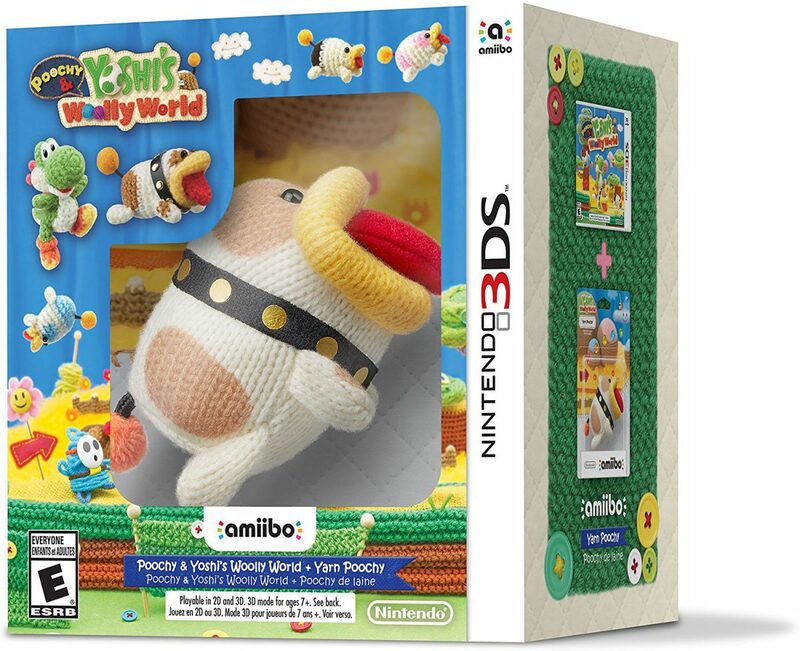 The game will contain all the content from the original Wooly World release as well as some added bonuses. There will now be time trials that put players in control of Poochy for extra challenges. There are also added stop motion cutscenes to explain the story of Poochy and Yoshi in their world made of yarn. For those who opted out of a Wii U, this port is a great addition to the 3DS library. For fans of the Yoshi series, this is a great spotlight for Poochy that many will enjoy, especially with their new Yarn Poochy amiibo. The game will run the usual $4o USD without the amiibo bundle, so if you haven’t picked up Yoshi’s Wooly World yet, be on the lookout in February to try it out on your 3DS! The new DLC has finally released for the Animal Crossing 3DS version, titled Welcome Amiibo. Welcome Amiibo allows users who own amiibo cards or figures to use them in conjunction with their Animal Crossing: New Leaf to import their favorite characters into town. This update is packed full fun new things to do, of course in the style of Animal Crossing’s laid back gameplay style! One of the biggest parts of this update is the addition of the Camp Grounds which tapped Amiibo characters will park in. Each Amiibo character comes with their own decorated RV that you can visit and look around in. On top of that, this update will shovel in several new items from series including Zelda and Splatoon to decorate your in-game house with. You can even scan in some non-Animal Crossing amiibo like the Squid Sisters to meet their in-game animal counterparts. if that isn’t enough you now can earn Meow Coupons by doing daily tasks like cleaning up the town. These coupons are easily redeemable for items or bells when turned in. There are also two new mini-games that have been added to the title. You can access both of these by using the in-game Wii U and 3DS items for each separate one. If you find yourself stuck in one of the games than you even have the option of tapping an amiibo for some extra help. Finally, there is the Amiibo camera which you can use to take pictures of your favorite Villagers from the game! As for non-Amiibo related features, you can now have unlimited storage after building your second floor in the game. You also will get new touch screen controls at that point as well for decorating your house easier, and if you ever wanted to start fresh in a new town, there is an added option for selling your current one for bells. All this content comes completely free with the update. There will also be a new line of 50 Amiibo cards sold starting December 2nd for the game. So get ready to have some fun in your dusty little town. Added bonus upon the installation of the download all weeds are automatically pulled!